Sure, one of the biggest trends in drinkware is stainless steel – everyone wants one! Popular retail brands, like Yeti, offer expensive drinkware pieces that boast impressive performance. However, these popular, retail-brand drinkware pieces don’t necessarily outperform tumblers at a much lower price. There is no need to spend $30-$50 per tumbler. ePromos 20-ounce Stainless Steel Tumbler has an extremely budget-friendly price as low as $4.19! You get all the look and feel of the popular retail brand names and great performance, like keeping your drink cold for up to nine hours and your coffee hot for four hours. Try them — your marketing budget will be happy because you are getting a trend-setting tumbler at a fraction of the cost! The spill and splash proof snap-on lid has a super tight seal using rubber for a secure fit. The lid is crystal clear (just like those retail brands) and has a slide closure. The slide closure prevents spills, is straw friendly and helps keep your beverage stay insulated longer. The lid is crafted from durable 100% BPA-free plastic and is long lasting, easy to clean and dishwasher safe. Please note that the sip hole cover is not designed to create a watertight seal and will not prevent leakage if tipped over or held at an improper angle. Using the natural insulating power of air, this tumbler features a double wall outer shell. This double wall means the temperature outside doesn’t easily reach your beverage on the inside. Insulated tumblers have become just as popular for coffee and tea as for cold drink – keeping beverages hot long after a morning commute. Two more features of this tumbler are a black, plastic liner and a non-slip base to help prevent spills. There is a 3.5”x1.5” area for your logo. Tumblers can be decorated by printing your logo using a screen-printed process. ePromos stainless steel tumbler can create impressive designs. An alternative decoration method for this tumbler is to laser-engrave your logo onto stainless steel, please contact a Brand Consultant. Laser engraved means you have high precision for detailed graphics so they will be clearly legible. 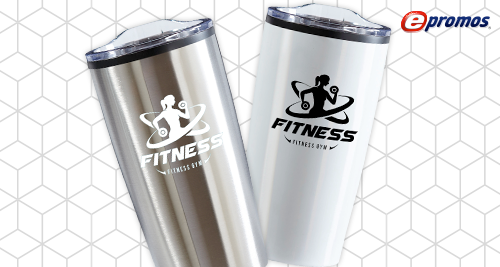 Laser-engraved promotional products are permanent and will last as long as this stainless-steel tumbler lasts making them a great add-on option to consider. Choose these tumblers as employee appreciation gifts, customer loyalty gifts, sales recognition programs, special events, business anniversary celebrations, incentive programs, holiday giving, golf tournaments (as they’ll perform in hot weather) or other commemorative occasions. These promotional products are also great ideas for the travel industry, outdoor activities, financial businesses and more. ePromos Tumbler (SKU 10007462) is made of stainless steel which offers an increased level of performance and functionality not found in other materials. Stainless steel has life-long durability, and it’s virtually indestructible. This impact-resistant quality won’t diminish over time, even after repeated use and abuse. In addition, stainless steel has antibacterial qualities. Many of your customers will appreciate the life-long sustainability (100% re-useable and 100% recyclable) of these tumblers. Any reusable drinkware is better for the environment than disposables, but stainless steel goes beyond and is one of the world’s most recycled materials – more than paper or glass. Now for the rest of the story: Drinkware made of stainless steel and durable plastic will be appreciated by your customers and employees because this high-end retail-lookalike is so easy to clean, whether you are washing by hand or putting it in the dishwasher! Plus, stainless steel is resistant to stains, rust, and corrosion. Your logo will look great for years, so this affordable purchase will be a lasting investment that reflects well on your brand, keeps your friends, family, customers and team healthy and shows a commitment to the environment! Check out more Drinkware and Stainless Steel Water Bottles from ePromos!